Manufacturer & Supplier of Air Control Sliding Dampers. 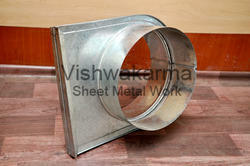 Our product range also comprises of Sheet Metal Ducting Fittings and Fabricated Rectangular Duct. Owing to our expertise in this domain, we are betrothed in manufacturing and supplying an extensive range of Air Control Sliding Damper. These sliding dampers are manufactured by our professionals using optimum quality indispensable material. Owing to its finest quality, durability and corrosion resistance, this bar is extensively demanded in the market. Customers can avail this sliding damper at industry leading price within confine time.